Indiana State Fair and Exposition, 1873. Spanning Exposition Avenue (now 19th Street) between Hudson and Ogden (alleys immediately west and east of Alabama Street) Image: Indiana State Archives. The location, scale and wares have changed, but the premise remains the same: gather Indiana’s best art, agriculture, science and industry for concentrated display and consumption. 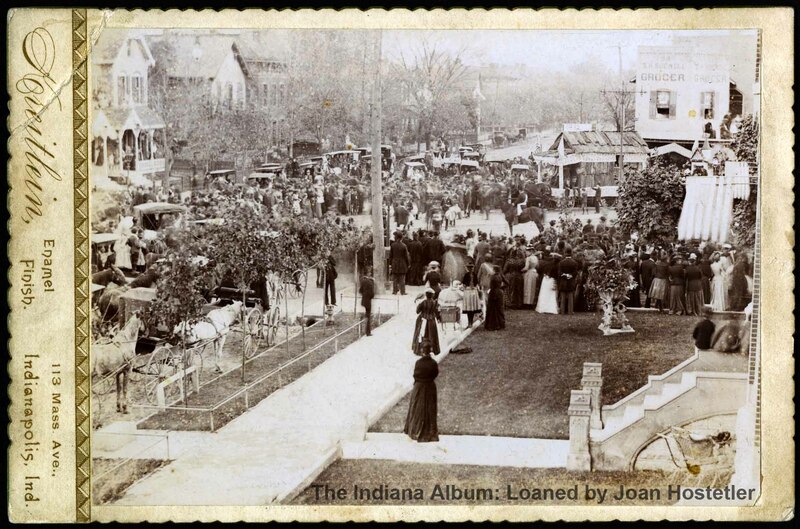 The State Fair is a coveted Hoosier tradition begun in 1852 in Military Park. 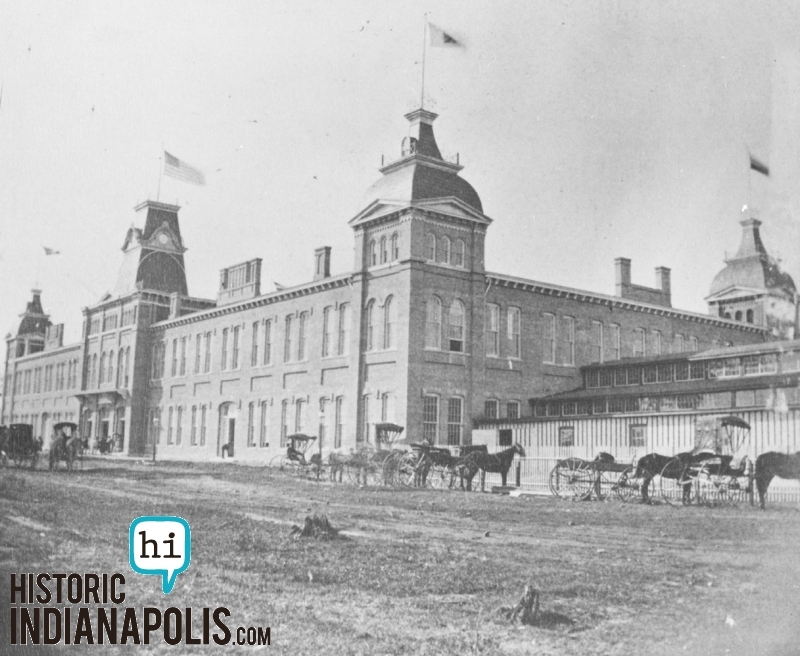 The event flirted with a handful of other locations in years following–even outside the capital city–but in 1860, the State Fair and Exposition staked out land within the boundaries of today’s Herron-Morton Place neighborhood for its permanent home. A most notorious chapter in U.S. history almost immediately thwarted the annual Indianapolis event. The Fair’s new home was requisitioned for Camp Morton in 1861, where many Hoosier lads started their Union Civil War soldier experience and later, where a number of Confederates soldiers ended theirs. 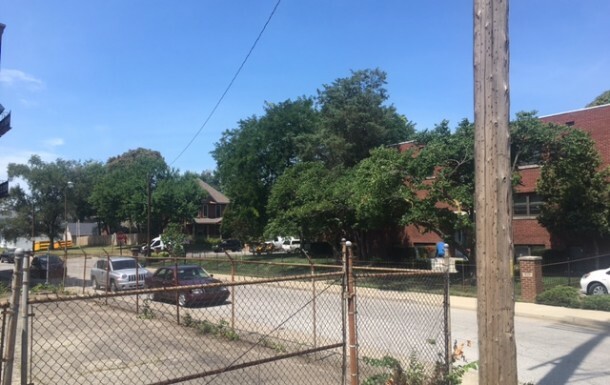 While no shred of State Fair history remains in Herron-Morton Place today, the Civil War history reminders live on in small markers at the corners of 19th and Talbott, 19th and Central and 21st and Talbott, and a larger, more descriptive one in front of the neighborhood park. 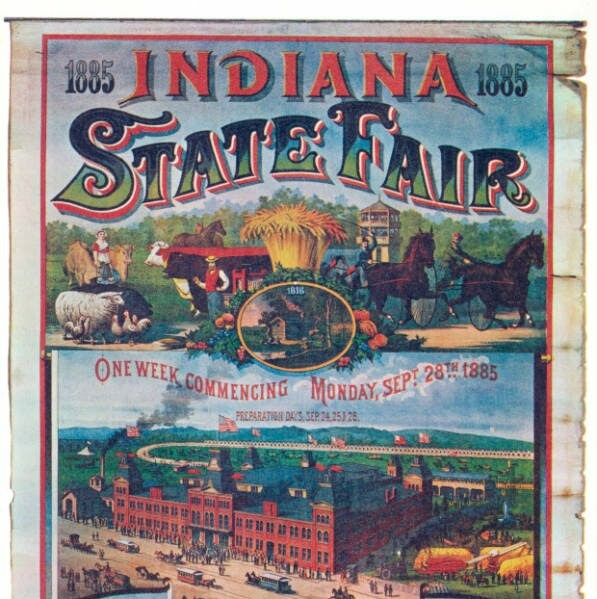 However, the Indiana State Fair did take place on the same 36 acres in 1860, 1866, and from 1868-1891. The imposing Grand Hall Building (pictured above) was composed of one million bricks and designed by Edwin F. May, the same local architect of Indiana’s current State House. 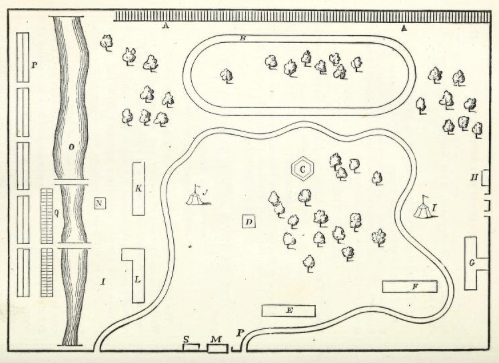 Beyond the primary building, smaller structures peppered the landscape, interspersed with a variety of animal sheds, and on the north, a half-mile race course. All of this (and more!) fit inside the boundaries of what is today, 22nd to 19th streets, and Central Avenue to the alley west of Delaware. Back then the month-long fair was known as “The Indiana State Fair and Exposition,“ and tens of thousands crowded the buildings to see the pumpkins, patented butter churn, and women’s work; to witness popcorn men beckoning fairgoers to sample their heavenly smelling wares– answered by the discordant echo of lemonade men doing the same. From organs to stoves, beets to apples, clothing to carpets, all sandwiched between brass bands intermingled with a spectrum of every-aged visitors–the latest advancements and novelties delighted and showcased what was possible in the midst of the industrial revolution. Check out a sampling of items that appeared at the fair at the time of this Exposition Building (and later). When they did arrive, as seen above, tree stumps marred the street. This is an often overlooked detail of early streets carved from what had been stretches of tree-shaded wilderness. Horse carriage axles were built intentionally high due to the pervasive stump issue. It was challenging to get there, but the people were determined to get there, visiting from every corner of the Hoosier state. Plans did not unfold exactly as anticipated, since the building didn’t turn out exactly as described, and it wasn’t built until 1873. The “Grand Hall” was 308 feet long and 150 feet wide. 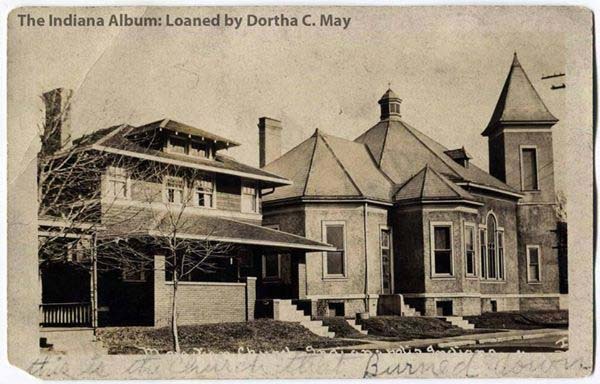 It cost approximately $100,000 (including decorations) and the architect, Edwin F. May was paid $500 for his services. 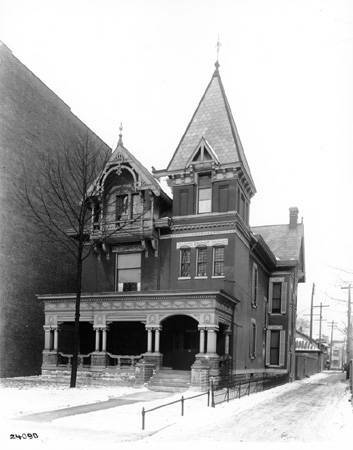 In January 1892, the Grand Hall was razed, as the land was platted into Morton Place, a tony neighborhood with esplanades stretching from 19th to 22nd Streets on Delaware, Alabama, and New Jersey Streets. NextFriday Fave: After 1890 State Fair, See This! Remarkable that the huge Grand Hall Building of 1,000,000 bricks and a $100,000 investment, was demolished only 19 years after it was built! Good grief; ‘talk about government waste…. Agreed, Bob! More evidence that history, indeed, repeats itself! Excellent article! 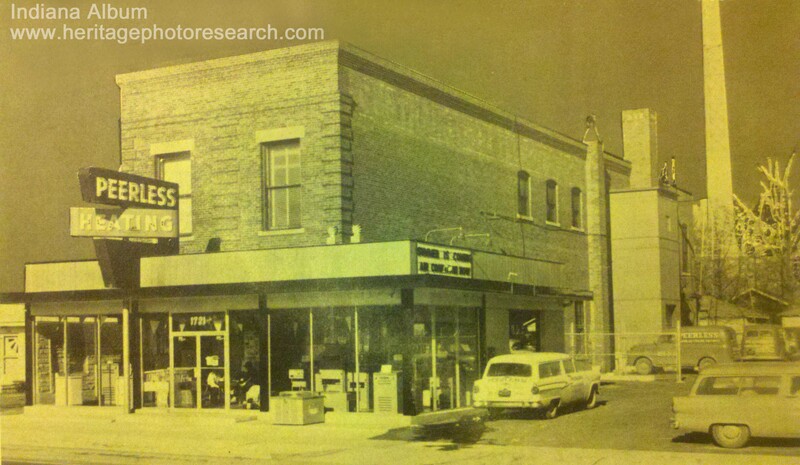 My two brothers and grew up just a few blocks from 19th and Alabama. I knew that the Civil War prison/camp was located there but had failed to hear anything about the State Fair. I’m curious about the street names. 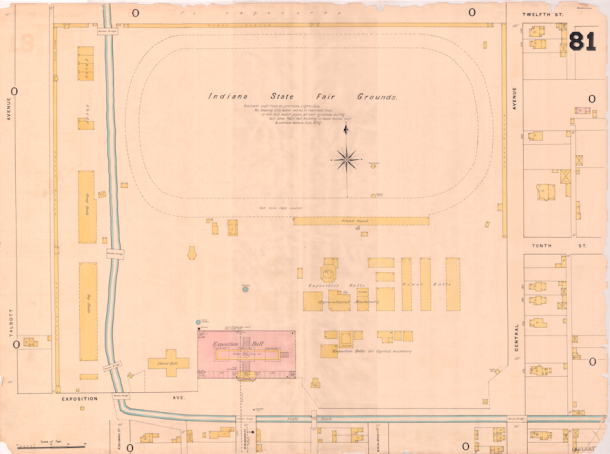 It looks like the North and South boundary streets were 12th and Exposition in the old map. When did they change 19th and 22nd? Not sure which map date you are referring to? 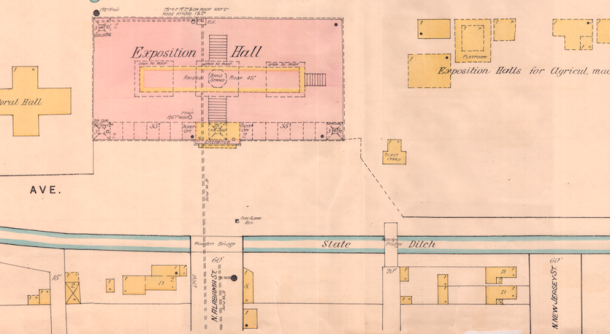 The 1887 Sanborn map featured in this article? Exposition Avenue did change to 19th Street, just as Seventh became 16th Street. I don’t recall what year off the top of my head, but believe it was the early 1890s. So many street names changed over the years. We are collecting data for an e-book on the changes for researchers. Stay tuned for that in the next year or so. Thanks!